Dubai, United Arab Emirates (February 3, 2019): A pioneering sustainability initiative introduced by leading retail brand, Splash, which encouraged householders to recycle their old clothes, resulted in over 11 tonnes of clothes being collected. Some of the collected items, were distributed amongst underprivileged communities in Africa. 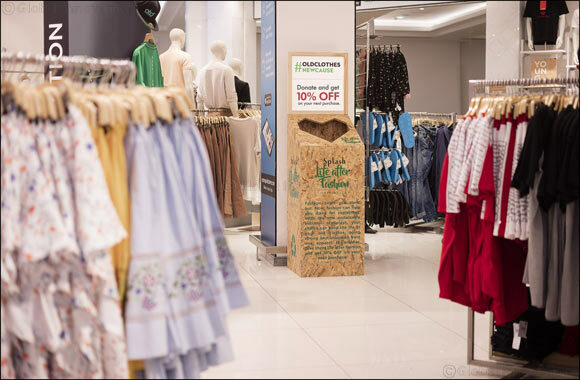 The ‘Life After Fashion” campaign saw Splash working closely with UAE-based laundry firms to communicate the message of Life After Fashion and consumers were encouraged to visit Splash stores and drop their unwanted items in specially designed boxes placed at the brand store. All these items were then delivered to Hands Industries who further categorised them into provision for used clothing markets, donation to African countries or for recycling purposes. The design of the hangers was pivotal to the success of the campaign, as they depicted images of the types of people benefitting from the project, and as such they provided an essential human element which resonated effectively with the public and prompted them to take action. The decision to utilize laundry companies who were able to conveniently reach out to their regular customer base and provide an efficient distribution and collection channel also contributed to the campaign’s success. A second phase of the innovative campaign saw collection points installed in Splash stores, with shoppers encouraged to donate their old clothes as they purchased new items. Raza Beig, CEO, Splash, Iconic & Landmark International & Fashion Director – Landmark Group: “Our aim was to raise awareness about the huge amount of unwanted clothing items that people throw away, which go into landfill, but which can be easily recycled for the good of others. We are very grateful for the co-operation of the public who donated their unwanted clothing and for the laundry companies who participated in the initiative and made it so feasible. We are delighted that so many people are benefiting from the campaign. The initiative will now continue as part of our long-term sustainability endeavours.